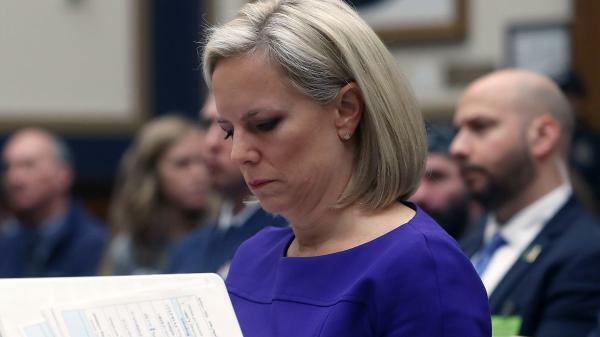 Homeland Security Secretary Kirstjen Nielsen looks at her papers while testifying before members of the House Judiciary Committee on Thursday in Washington, D.C.
That's true regardless of the migrants' country of origin: Many people crossing the U.S.-Mexico border are not Mexican but are fleeing violence in Central America.
" 'Catch and release' will be replaced with 'catch and return,' " Nielsen said, using the Trump administration's preferred term for current U.S. asylum claim practices. Speaking before lawmakers on Thursday, Nielsen also emphasized that DHS cannot detain families with children for more than a few weeks under U.S. law, which is not enough time for an asylum claim to be processed. Earlier this year, the Trump administration began separating children from parents who were being prosecuted for illegally crossing the border, a policy that horrified many Americans and was ultimately found to be illegal. Sending families back to Mexico would provide an alternative method for the administration to avoid releasing such families into the U.S.
"I think the ultimate plan is to prevent people from wanting to apply for asylum so they won't come to the United States," Powers said. The Mexican government, while affirming its own sovereign rights to determine who enters the country, said it would allow the practice. Mexico also said it would extend some rights and protections to the non-Mexican asylum-seekers on Mexican soil who await immigration hearings in the U.S. This is a major policy reversal for the Mexican government, which has traditionally refused to accept third-country migrants from the U.S. The new shift will very likely be seen as a capitulation by Mexico's new president, Andrés Manuel López Obrador, as he tries to maintain cordial relations with President Trump. The Trump administration said earlier this week that it will contribute nearly $6 billion toward Mexico's recently announced $30 billion development plan for the southern part of the country and three Central Americans countries, in hopes of creating jobs and opportunities so people from the region won't have to migrate. Last month, The Washington Post reported that the Trump administration had reached a deal with Mexico to allow asylum-seekers to remain south of the border while their claims were processed. However, governments of both countries would not publicly confirm that a plan was in place, in part because the new president was days away from taking power. The announcement on Thursday appears to confirm those early reports. In late November, Lee Gelernt, an attorney with the American Civil Liberties Union, said there were questions about the legality of such a proposal. "One thing we know right off the bat is that it cannot be legal unless they can assure all the asylum-seekers who will be stranded in Mexico ... will be safe — not only from persecution by state actors in Mexico, but by criminal gangs," Gelernt told NPR. "And from what we know about what's going on, we see no likelihood that that is going to be true." On Thursday, Jacinta Ma, director of policy and advocacy at the National Immigration Forum, agreed that the proposal raises legal questions. "I would definitely expect a legal challenge, especially seeing all the legal challenges filed against the Trump administration on immigration matters," she told NPR. The news comes during a time of close national attention to issues of immigration and asylum, as Trump continues to denounce migration as a national security threat, and critics of the administration's actions accuse the White House of inhumane policies. The recent arrival of a "caravan" of Central American migrants at the U.S. Southern border brought fresh attention to asylum-seekers, particularly after a clash between protesters and Border Patrol agents. The Trump administration has been setting limits on the number of people allowed to claim asylum at those ports of entry per day. The result has been a massive backlog of migrants waiting to claim asylum — in addition to a backlog of migrants who have claimed asylum and are awaiting processing. The death of a 7-year-old migrant girl in Border Patrol custody this month has brought fresh outrage to the debate, as did the killing of two Honduran teens last weekend. The teenagers were killed in downtown Tijuana, not far from a migrant shelter for unaccompanied minors, where they were staying while they waited to start an asylum claim with the U.S. Meanwhile, Trump continues to seek funding for his border wall, which he had originally claimed would be paid for by Mexico. He recently said that Mexico is essentially paying for the wall through the new deal to replace NAFTA, a claim that is not true.